It’s a free world, but don’t give it away. The internet is a marvelous thing, but it does seem to make some people take leave of their senses. My name is Miss Adilah Elya Adira, I am an only child of my parents, 26 years old, I am a citizen of Malaysia; a computer analyst with Bank Negara Malaysia. (Central Bank of Malaysia) I just started working with this Bank. I came across your payment file and took my time to study it and discovered that15, 5000,000.00 was forwarded to this bank with immediate payment Signal and authentic approval many months ago from an affiliate/mother Bank in Africa as part payment of your inheritance fund…. Oops! I broke confidentiality. Oh well, sorry Adilah, best try someone else. Now of course if people fall for this kind of fraud, that’s pretty serious, but are people really so gullible that they give their valuable information away? I fear so. Now although it’s clearly less serious, and it’s not fraudulent, I believe there is a subtler exchange going on regularly which prizes valuable assets away from the unsuspecting internet user. Just last week I was reading a discussion on Linked In, posted on a photographers’ forum, which started when the publisher of an on-line photography magazine requested images from photographers who might be interested in submitting their work to be showcased around the world (that’ll be The Internet then). The pretense is that photographers submitting their work will gain a global audience, wider recognition and perhaps some business through having their pictures published online by the magazine. For free. Now I know no one is having their arm twisted to give away their work, just as no one is having their arm twisted by the charming Adilah to give away their bank details. And I’m willing to accept that the magazine is a great deal more genuine than the flimflam story of funds being transferred via hard drive to my bank account, but I think if people are going to give their photography away for nothing, they need to think long and hard before doing so. The internet is a MAHOOSIVE! entity, and like the universe it is constantly expanding. By giving your images away to an on-line publication (which in this case, from my investigations, takes both advertising and subscription revenue), you are devaluing your work, and highly unlikely ever to get the recognition you would like or the leads to future business you might hope for. I’m not going to name and shame the magazine; we’ll call this a self-imposed injunction, but as an example of how far letting your work go cheap or free gets you, let’s use the case of Robert Lam, who sold his Time magazine cover shot for (reputedly) $30. This was back in 2009 so I assumed that by now, having got “exposure” in Time magazine, he’d have a swanky website and maybe a Beverly Hills studio. Googling his name though only seems to bring up sites reporting his naivety. Getting the Time cover doesn’t seem to have progressed his career one inch. Even his Model Mayem profile, where he first announced his great Time cover achievement, appears to have closed. Perhaps Robert became unbelievably wealthy, but then lost it all when he responded to an email from a Malaysian banker called Adilah. I stand to be corrected, so Robert, if you see this, let us know how getting the cover of Time and $30 changed your life. Never published (from a personal project): It isn't just about the money, it's about self respect. Interesting plot, but predictable outcome. I’d hoped to comment much earlier on the government-commissioned independent Review of Intellectual Property and Growth, but the resulting document produced by Professor Hargreaves and his team has taken me far too long to wade through while still trying to get on with the business of being a photographer. And herein lies a common problem with such reviews. Those who stand to lose the most are the ones with the least time to spare to influence and pour over the review’s conclusions. Like may photographers, I simply don’t have time to wade through all 123 pages of the report. 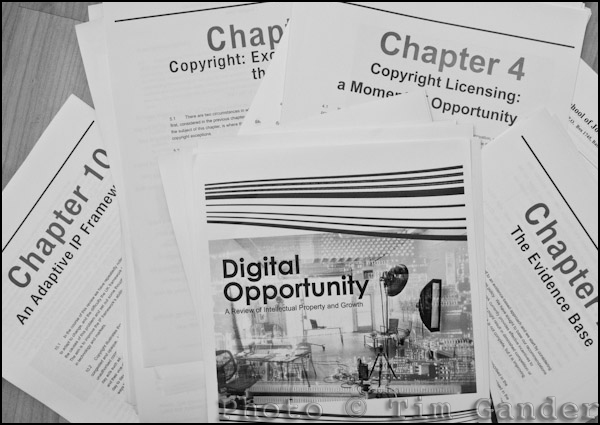 I submitted my views back in March, and they were duly noted and published on the Review site, but apart from a few passing references to photography, the review seems to have concerned itself more with music, film and TV rights when dealing with copyright in the creative industries. So you’ll forgive me (probably thank me) if I don’t go into great detail here about what I think of the review, it’s implications for professional and amateur photographers. I think I may be review-weary, especially as many of the arguments raised and defeated in the Digital Economy Bill debate are predictably reappearing. What is quite ironic though is that one of the main areas for the review to consider was that of Fair Use of copyright works. But it would seem the one thing he picked out for special consideration appears to be the one thing the review recommends against, the truth being that although the USA does have Fair Use exceptions to copyright, this has done nothing to stem the tide of legal actions in copyright disputes. Cameron was mis-guided to site Google as an example in any event, because unless I’m missing something, Google appears to function perfectly well in this country. In fact I suspect that had Google started in this country, it would have been when their service hit US digital territories that they would have run into trouble. There’s a generous smattering of conditional terms in Cameron’s introduction, such as “feel”, “some people” and “believe”. In other words, Google had a hunch their startup stage would have been hampered in the UK, but they have no real evidence to support this view. 1 Orphan works is back – I hope someone sees the sense to keep contemporarily-created images separate from museum-held works. Not an easy distinction, except that any orphans then can ONLY be works which have been digitized from orphan originals held by museums, art galleries and other public bodies. And images cannot be called orphans just because the meta data has been stripped (as happens when images are submitted to Facebook, BBC etc). 2 No apparent extra protections for photographers works – no sanctions against the stripping of IPTC info, or the willful creation of orphan works. 3 Worrying references to “flexible legislation” which potentially means copyright law can be changed without recourse to Parliament. At this stage I can’t say I’m getting overly anxious. The report will be poured over and picked apart. For any of it to become legislation it will have to be drafted by lawyers and debated in Parliament, and in the meantime it seems rulings are coming from the EU which point to better protections for creators, and all this needs to be standardized across the EU, including the UK. One final irony is that while the report seems to be concerned almost exclusively with music, TV, films and games, the cover features a photo of what appears to be a photographer’s studio. It would be nice if they’d bothered to listen to photographers then. A popular pic. Can you see why? Another trip down memory lane this week, and this time I risk accusations of blatantly fishing for blog hits by featuring this photo of former Page 3 model Leilani Dowding. She’s modeling a bikini which Swatch wanted to promote at the time (no pun intended) as there was a watch incorporated into the design. There is a reason for this picture being here though, because it’s been fascinating to see that although my website is dedicated to corporate, press, PR and commercial photography, this is the photo which has had the most views out of all the pictures on my site. I don’t mind revealing that it’s had 138 views to date. That isn’t all the people that have seen it, since you can see it without clicking on the website thumbnail. That’s how many people in about 18 months have gone to the trouble of clicking on the thumbnail image to see it larger. Bearing this statistic in mind, it’s hardly surprising that Marilyn Monroe comes in second with 103 views, but then my Skinheads picture scores 89 to achieve 3rd place. A slightly worrying top three, but of course the hits aren’t necessarily related. Now I should be pleased that some of my pictures are so popular, but this rather odd bag of stats highlights that just having a picture seen a lot isn’t going to bring in business. Indeed, I think I can categorically say that none of those three images has ever pulled in a genuine client. My examples of corporate portraits and the like, with much more modest hits in the range of 30-50 have done a better job of bringing in work. It just goes to show that pretty photos don’t always bring in work. A popular picture isn’t always going to bring in business. For businesses using photography, if it’s shot well and is relevant to your business it’ll have a much bigger impact on income than something which is just “very nice to look at.” This thought should guide how you present your business. In the meantime, I can’t bring myself to take the Leilani photo down. It’s obviously bringing pleasure to some people, and she certainly adds a splash of glamour to the gallery. As for Leilani herself, she was lovely to work with. Utterly without pretense, and of course, thoroughly professional. We’d previously done a shoot together to promote a gardening kit giveaway for the News of the World, but that picture isn’t half as glamorous! For this week I thought I’d dig out something from the archive; a portrait photo taken with press use in mind to help illustrate the difference between this and a straight headshot. In fact the photo here was commissioned by the News of the World for a business page article back in 2001. 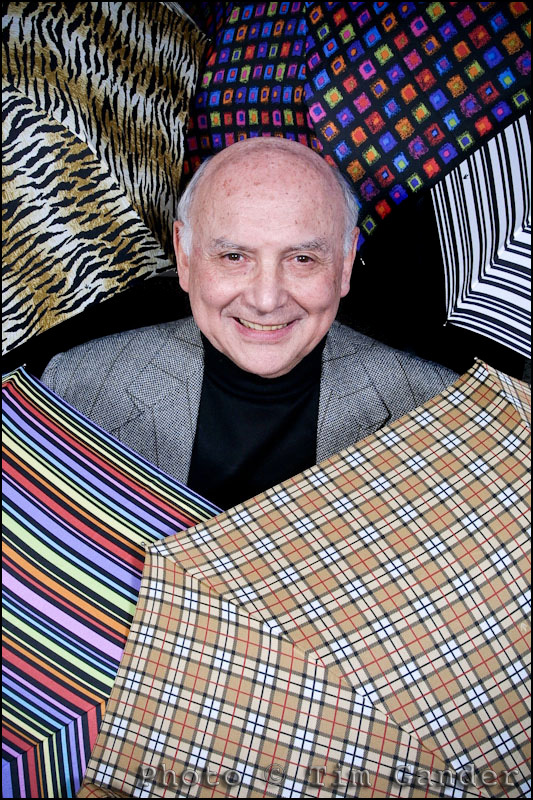 Nothing dodgy (for once), just a straight-up business story about Fulton Umbrellas‘ founder Arnold Fulton. He's not Rihanna, but he's got umbrella ella ellas. He was utterly charming, patient and engaging. He told me it’s ok to open an umbrella indoors provided you don’t lift it over your head, so putting my superstitions to one side I got on with opening a selection of umbrellas in the factory’s demonstration/sales room ready for the shot while Mr Fulton was being interviewed. When you’re thinking about having pictures taken with a view to press coverage, you might be lucky and find that a newspaper wants to cover your story and they might send their own photographer to take pictures to go with the article. However, if you’re putting an article together and need pictures to send out to press, it’s worth keeping in mind that a straight headshot of the CEO (or whoever is quoted in the article) may not be enough. Think about using elements of your business in the photo, even if you’re not dealing with physical goods. Sometimes a physical prop can be a metaphor for the service you offer, so don’t think that just because you sell pensions or insurance that there isn’t something to illustrate this. My point being, think around your business and the story to see what might suit what you’re writing about. I’m happy (as any decent photographer should be) to discuss ideas with you. Don’t just dig out a portrait taken with the company logo in the background and assume it’ll get used. And even if it does get used, most people will ignore it as “just another headshot.” Far better to have a shot which helps illustrate the story. It will reinforce the point of the article, and most importantly of all, more people will read it. As for Arnold Fulton, he insisted every visitor to his factory takes home an umbrella, so I chose a storm-proof golfing model which is still going strong today, which might explain why I’ve enjoyed the return of the rain even more than most people. At least in a livestock auction bidding tends to go up, not down. The parallels between the photographic industry and farming aren’t as obscure as you might think. Imagine Getty are the Tesco/Asda/Sainsburys of the picture world, where the suppliers of the produce they sell have little control over the price they’re paid for their goods, regardless of the cost of production. There are only so many outlets for farmer photographers, owned by some very powerful businesses that will set the selling price to wherever they think they need to in order to gain market share and make a profit. I mention profit, but I’m not sure if Getty (who also own iStockphoto) are in profit for their stock photo portfolio of businesses, and reliable figures seem elusive, but they’re certainly good at spending whatever money they have on expansion plans. 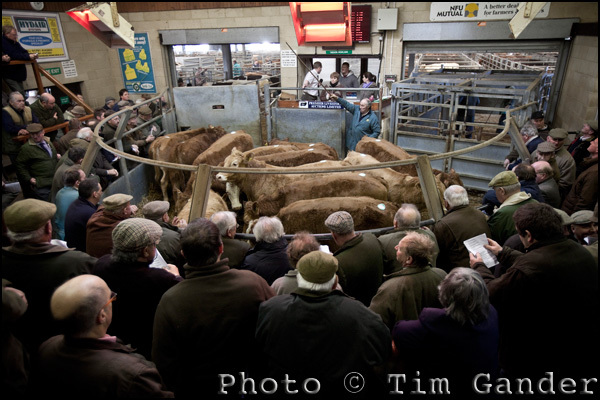 One advantage farmers have over photographers is that they are paid for their produce by the wholesalers or retailers who then sell it on for a profit, while stock photographers give their work to the libraries for free in return for a commission, but only if a photo sells. And a photo might never sell, or might only sell for a few pence, of which the photographer might get a few pennies. By way of leaving the farming analogy to one side, I’d like to say I have the utmost respect for farmers and I’m glad they do a job many of us couldn’t cope with. The news that Getty have now acquired the Australian stock image library Photolibrary, close after the announcement that they’ve also acquired image-tracking firm PicScout, means Getty are still aggressively expanding and consolidating their business, but you won’t see photographers jumping for joy and I think in time neither will picture buyers be especially delighted. Getty will want to see a return on their investments, so it may be we can expect them to switch the PicScout phaser from stun to kill as they target image infringers and recoup their money through either higher or more numerous payment demands. As for their buying up yet another image library, what possible advantage is there to a business or a designer that they can now choose from an even larger library of the same old same old? Surely once you’ve seen one sterile business picture, you’ve seen them all. Getty can’t claim to have extended buyer’s choice any more than Heinz can claim to have extended our choice of baked beans by making more tins of the same beans. It also appears that Getty are looking to turn the screws once again on their contributing photographers by introducing terms that mean Getty will be able to move images from Rights Managed to Royalty Free licensing, with no mechanism for contributors to opt-out of such a scheme. This leaves contributors with less control over how their images are used and the prices set. For buyers, it will mean even less exclusivity, making stock imagery even less attractive than it already is. That final point probably explains the rise in enquiries I’m getting from businesses that are wanting to break free from the herd and be noticed (back to farming! ), but I’d rather Getty used less aggressive tactics anyway because they don’t reflect well on the industry as a whole. It’ll be interesting to see where all this activity leads. If Getty want to take a lion’s share of the market with a view to pushing up stock image prices, they may find this is a very long game indeed. I’m sure they have a plan, but in this world of over-supply and finite demand, it’ll have to be a very cunning plan or a game with infinite budget. UPDATE: ASMP makes thinly-veiled suggestion to American photographers that if they contribute to Getty, they should consider other means of distributing their images (in other words, quitting Getty). More at PDN.